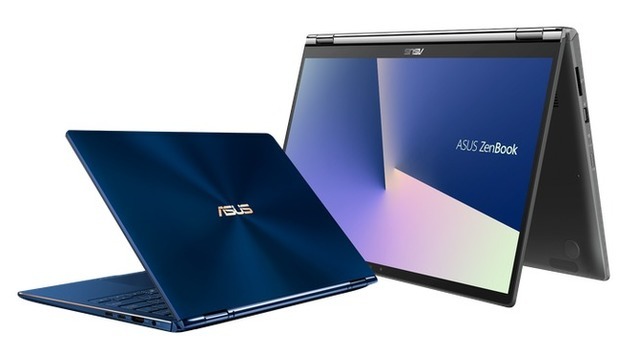 ASUS have released new, upgraded takes on their Zenbook and Vivobook series at this year's IFA in Berlin. The Zenbook 13, Zenbook 14, Zenbook 15, Zenbook Flip 13, Zenbook Flip 15 and VivoBook S13 are all getting refreshed. The new Zenbook 13, 14 and 15 feature 8th Gen Intel Core CPUs, up to NVIDIA GeForce GTX 1050 Max-Q graphics, 16GB RAM, PCIe SSDs and gigabit-class Wi-Fi. They also boast improvements when it comes to physical form factor. ASUS say it's their most compact Zenbook series to date, with ultra-slim bezels on all-sides ensuring you still have plenty of screen space to work with. The new Zenbook also incorporate a NumberPad track-pad, which looks similar to the ScreenPad featured in the company's more premium Zenbook Pro 15. The new ASUS ZenBook 13 (UX333), ZenBook 14 (UX433) and ZenBook 15 (UX533) will be available in Australia from early November. Pricing and configurations will be announced at launch. The Zenbook Flip 13 and 15 series also tout the new NumberPad alongside a 360-degree ErgoLift hinge and PANTONE-Validated display. Under the hood, both convertibles offer 8th-gen Intel Core processors, 16GB and SSD storage with the larger Flip 15 also offering discrete graphics in select variants. ASUS ZenBook 13 (UX362) and ZenBook 15 (UX562) will be available in Australia from early November. Pricing and configurations will be announced at launch. Finally, the new Vivobook S13 features a 13.3-inch frameless NanoEdge display, an 8th Gen Intel Core i7 CPU and NVIDIA GeForce MX150 graphics. Incorporating the same ErgoLift hinge found in the Zenbook Flip, ASUS claim the new Vivobook S13 is one of the world’s smallest and lightest 13.3-inch laptops. ASUS VivoBook S13 (S330) will be available in Australia from late October.